When Amazon.com opened for business on July 16, 1995, it was nothing more than a few people packing and shipping boxes of books from a two-car garage in Bellevue, Wash. Jeff Bezos, Amazon founder and CEO, had left New York City for the Pacific Northwest, using some of his time on the road to write the company's business plan. Books were packed on a table made out of an extra door they found lying in the new home  a practice the company continues today in spirit by making many of the office's desks out of doors. Now, on its 15th anniversary, Amazon can raise a toast to being one of the largest online retailers in the world, selling everything from tubas and golf carts to dishwashers and diapers. Despite the economic recession, online retail in the U.S. grew 11% in 2009, according to a March 2010 report from Forrester Research. More than 150 million people  about two-thirds of all Internet users in the U.S.  bought something online last year. It's a staggering leap for an industry used by 27% of the nation's online population a decade ago. 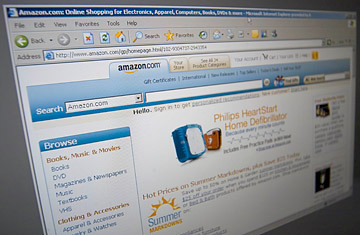 One of the first known Web purchases took place in 1994. It was a pepperoni pizza with mushrooms and extra cheese from Pizza Hut, a somewhat appropriate purchase for the early days of the Internet. When Amazon came on the scene not long after, selling books online was a curious idea. After all, why would people buy a textbook online when they could go to a bookstore? But eventually, a revolutionary change in culture and groupthink took place. Buying things online was all about price and selection, says Ellen Davis, a vice president with the National Retail Federation. If you lived in a small town with just one bookstore and they didn't stock the novel you wanted, the Internet was a solution. The big sellers were "hard goods," those things you didn't have to touch, feel or smell in order to buy, such as books, computers and other electronics. Now, nothing is off limits. "As the Internet has evolved, it's become a channel where you can buy anything," Davis says. "You can buy fragrances  something you would have normally thought you would need to go to a store and actually experience before you decided to buy." Part of the shift has to do with the normalizing of giving out personal information online. All it takes is one click of the purchase button before consumers start to feel more comfortable using their credit-card information online, Davis says. Now some consumers have so much trust that they allow retailers to save their credit-card and shipping information, which has given rise to a painless checkout process. Witness Amazon's 1-Click shopping. And part of it had to do with making the online experience more like an in-store shopping trip. Many sites geared themselves toward consumers who like to try before they buy. While Web shoppers technically have to buy the item first, sites such as Zappos, which specializes in shoes, and Piperlime, which sells clothes and accessories, offer free shipping on returns. If you buy it, try it and don't like it, having to return the item is less of a concern. Other stores try to make it easier for customers to get the look and feel of a product without actually handling the goods. Sears.com and Gap.com allow customers to zoom way in on products to examine their texture and color up close. Others such as Bed, Bath & Beyond and Buy.com feature product videos that allow shoppers to see, for example, a grill cleaner in action. And then there are sites like Overstock.com that capitalize on the goods physical stores can't sell. Beyond its discounts, Overstock.com wins customer loyalty by sprucing up online deals with flat-rate shipping of $2.95 on everything from earrings to refrigerators. Even famously resistant designers and luxury retailers are putting goods online. According to Bain & Co.'s 2009 luxury-goods study, while the luxury-goods industry overall lost 8% worldwide in 2009, luxury sales online grew 20%. This September MarcJacobs.com will have more than just videos of models strutting the runway on his website. Jacobs will join others such as Jimmy Choo, Hugo Boss and Donna Karan, all of whom sell, or will soon start selling, products through their websites. The upside? Consumers will soon be able to buy many high-end goods without the withering stare of a boutique salesclerk. All of this online shopping has given rise to a new version of one of America's favorite holidays. Cyber Monday was coined in 2005 to represent the boom in online sales that comes the Monday after Black Friday  the day after Thanksgiving and the largest shopping day of the year. Though Cyber Monday has never eclipsed Black Friday's sales, customers are more comfortable doing shopping online than ever. 83% of consumers say they are more confident in making a purchase when they have conducted research online as opposed to speaking to a salesperson in a store. While retailers were initially terrified of what bad reviews could do to their bottom line, they've since witnessed the power of a rave review and embraced the practice. Despite initial fears, says Craig Berman, Amazon's vice president of global communications, product reviews have only served to increase their customer loyalty. "It helped us build customer trust," he says. "It put us in a special place with customers in that they could come to the site and get honest and comprehensive  and over time, very substantial  firsthand knowledge from other customers." Berman says the company has some reviewers who take online shopping to heart. "There are some customers who are extraordinarily proud of being one of our top reviewers  they take their job really seriously." Some of Amazon's customers are voracious readers who consider it their duty to review one or two books every single week. While the company may have come a long way from its roots, the company's original specialty has not been forgotten.